Category - "Force concealment (Control)"
Article - "(MW) Revan concealed his dark power from thousands of Jedi." Revan's abilities underwent significant change and growth across his career. To emphasize Revan's power progression, the respect thread is separated into three distinct sections - Darth Revan, Redeemed Revan, and Revan the Returned - and designed to be read from top-to-bottom. Thus, there are three "telepathy" sections, three "willpower" sections, etc. Revan's greatest feats are marked with a "★" for emphasis and to quickly find again. Press the keys "CTRL" and "F" simultaneously to find something specific. "Force categories" are organized between "alter," "control," and sense" abilities. "Alter" abilities appear first, then "control," then "sense." Alter powers are Force abilities that affect the outside world, control powers are Force abilities that affect the internal body, and sense powers are Force abilities that immerse one with the outside world. "Other categories," unrelated to the Force, such as battle precognition, follow. While most Force abilities have their own categories, some may be found within other categories. This is indicated with bold text (e.g. "Revan blasted the team and the Outlander with Force destruction.") or found in bullet point lists in the "knowledge" category. Categories under the same umbrella (e.g. "telepathy" and "telekinesis") are organized in ascending order from the first chronological feat of each category. Sections are divided into multiple articles, which list the accolades or feats of the respect thread. Articles are structured in chronological order, with specific time periods listed (e.g. "JCW") for reference. The full translation of the acronyms (e.g. "Jedi Civil War") are found at the start of each section. Some articles have "author's notes" at the bottom, which provide my personal insight or clarification. Some articles or author's notes recommend the reading of complimentary articles (e.g. "See also: II/Telekinesis/R/3"), which go may relate to or go in-depth on a subject. The example annotation (e.g. "II/Telekinesis/R/IV") can be found by going to section two or "redeemed Revan" (i.e. "II"), then the "telekinesis" category, then the "R" or "Revan Reborn" time period, then the third (i.e. "3") feat listed under "Revan Reborn." Quotes that start with ">" are indirectly related to the article and may provide details of the opponent. The article Darth Malak - An Expanded Universe Character from Star Wars: Knights of the Old Republic, published by Wizards of the Coast and Lucasfilm, states Darth Malak with the Star Forge was far more powerful than Exar Kun or Freedon Nadd: "Did it provide him with powers far greater than even Exar Kun or Freedon Nadd, or was cybernetic enhancement too simple an explanation?" For clarification, the quote asks if Darth Malak was far more powerful than Exar Kun or Freedon Nadd because of his alleged "concealed cybernetic life-support," or if "cybernetic enhancement was too simple an explanation" and that there is another reason for his superior powers. This question is in obvious reference to the Star Forge, which vastly increased Darth Malak's Force abilities once he learned how to harness its power. This quote does not from a random, obscure source - it comes from perhaps the most meticulously verified article in Star Wars history. According to Leland Chee, the supreme authority of Star Wars continuity, Wizards of the Coast sent the article to him and Lucasfilm Licensing a month in advance for review. They checked over it and corrected any discrepancies. Wizards of the Coast made the changes and sent it back again for confirmation. Only after a second review was the article published. For the Expanded Universe series, which the Darth Malak article fell under, Lucasfilm Licensing even decided what content to include and provided reference material. 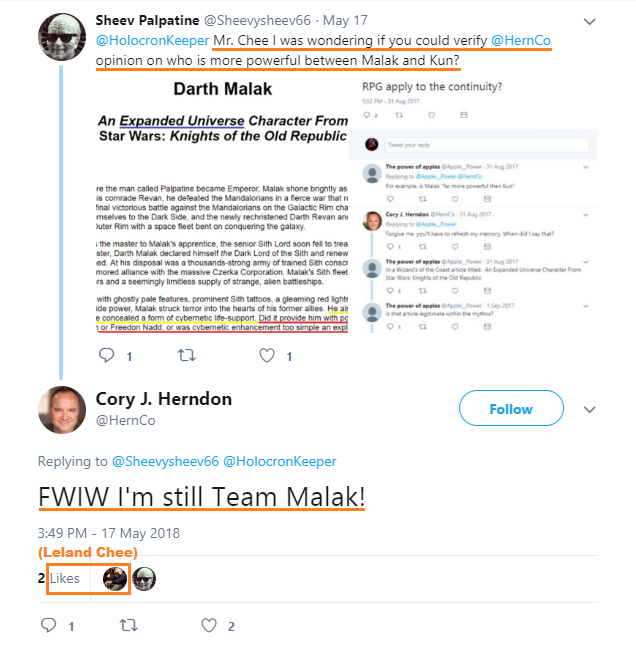 Leland Chee even liked on Twitter a statement by the author, Cory Herndon, again confirming that Darth Malak was more powerful than Exar Kun - (click to view: 1, 2). Revan was demonstrably far more powerful than Darth Malak on the Star Forge, defeating him multiple times consecutively after fighting through armies and Bastila Shan to face him. Also, Revan was likely weakened by the dark side nexus that empowered Darth Malak and further grew in power after the battle. Therefore, Revan possessed "powers far greater" than Darth Malak - and double that compared to Exar Kun. JT (Jedi Training) - Revan rose to prominence as the Jedi's greatest prodigy (3994 BBY to 3964 BBY). MW (Mandalorian Wars) - Revan led the Galactic Republic against Mandalore the Ultimate in the Mandalorian Wars, commonly sacrificing his morals and soldiers for victory (3964 BBY to 3960 BBY). UR (Unknown Regions) - Revan explored the Unknown Regions and discovered Emperor Vitiate's Sith Empire. The Emperor enslaved him and christened him "Darth Revan," but Revan quickly broke free of his control and created his own Sith Empire to stop the menace (3960 BBY to 3959 BBY). JCW (Jedi Civil War) - Revan set out to conquer the galaxy to unify it in his cause against Emperor Vitiate, but he was betrayed by Darth Malak and captured by the Jedi (3959 BBY to 3956 BBY). This section chronicles Revan's Force accolades and progression from in and out-of-universe sources. (JT) Revan was the embodiment of power and the heart of the Force, according to Kreia. "Revan was power. It was like staring into the heart of the Force. Even then, you could see the Jedi he would slay etched on his soul." Author's note: Chris Avellone, lead writer of Knights of the Old Republic 2, has clarified, "She was using hyperbole . . . but she's mostly commenting on how Revan was one of the strongest Force wielders ever." (MW) Revan amassed tremendous dark side power, then continued to grow stronger. But this young one, like the other Jedi brethren, is unaware of the tremendous dark side power wielded by Revan and the terrible secrets of Malachor V. Revan's power continues to grow, and he secretly strengthens his stronghold. (MW) Revan was the Jedi Order's most powerful and greatest champion. Though the Mandalorian fought valiantly, in the end he was no match for the Jedi Order's most powerful champion. "You must realize that Revan was as great as a Jedi could be." "Revan's tale shows us how even the greatest of Jedi can fall to the dark side." "Our heroes had become brutal, conquering Sith, and we were all but helpless before them. Think about it, if you can't even trust the best of the Jedi, who can you trust?" (MW) Revan had a greater command of the Force than Darth Nihilus, a Sith entity that raised a fleet of warships into space and drained the life force of many planets, according to Meetra Surik. It was easy to understand how Scourge could be drawn to him; Revan's command of the Force was greater than that of anyone else [Meetra Surik] had ever met. (UR) Revan passively left dark side impressions in the area around him. "Revan and Malak were here before us. I feel their dark presence . . . [They] were strong enough in the Force to leave a trace." "I sense that Revan once passed through here, leaving a strong impression behind in the crystals." (JCW) Revan was the Galactic Republic's deadliest enemy. The Republic hero known as “Revan” had a turbulent past. As a Jedi general in the Mandalorian Wars, he led Republic forces to victory; as Darth Revan, corrupted by the will of the Sith Emperor, he became the Republic’s deadliest enemy. (JCW) Revan was a Force nexus that allowed non-Force sensitives to feel the Force in his presence. "The Revan was here yesterday. It is a gift to be in the presence. I felt the Force - it travels below your skin, straight to the heart, lungs, the gut. A warmth and a chill." (JCW) Revan was one of the most powerful ancient Sith, according to Darth Bane. "The strength of numbers was a trap, one that snared all the great Dark Lords who had come before. Naga Sadow, Exar Kun, Darth Revan, each had been powerful." (JCW) Revan, along with Darth Sidious and Darth Caedus, was among the most powerful Sith in history. The Star Wars universe has created some truly vile dark side villains. Have you ever wondered what would happen if the most powerful Sith Lords (Darth Sidious, Darth Caedus, and Darth Revan) duked it out for supremacy of the galaxy? Author's note: The legitimacy of this quote is in dispute. Wizards of the Coast content is sanctioned and reviewed by Lucas Licensing, but "Sith Showdown" may be exempt because of its role-playing qualities. This section chronicles Revan's battlefield feats and lightsaber skills. Visit my "Revan's Lightsaber Abilities Overview" blog for a detailed analysis of Revan's fighting style, technical mastery, and best showings. (JT) Revan meticulously mastered everything Kreia, Zhar Lestin, Dorak, and other Jedi Masters knew, learning faster than they could teach. At the end of his apprenticeship, Kreia mused he learned everything he possibly could from the Jedi, signifying mastery of the lightsaber forms, Trakata, and other techniques. "He came to me, yes. Both before and after, before Revan knew himself. And after, in the times when Revan was coming into his own and learning he was more than he had been told. At one time, Revan was my Padawan. In times past, long ago. But Revan, when he had learned all he could, had other masters: that fool Zhar, and other Jedi on other planets. He learned from each. But in the end, he turned back to me. When he realized there was nothing more to be learned from the Jedi - except how one could leave them forever." "Revan had many Masters, Zhar, Dorak, Master Kae before Kae left for the Wars. Towards the end of his training, he sought out many to learn techniques. It is said that he returned to his first Master at the end of his training, in order to learn how he might best leave the Order." (MW) Revan was regarded as an invincible god by the Cathar warriors. "To us they seemed invincible, especially their leader, who they talked about all the time. Paragons of light and justice, sweeping away all iniquity before them. It was like looking at gods . . . They were enthralling, everyone wanted just to touch them. Some people thought it would bring them luck." (MW) Revan defeated many Basilisk war droids across his campaign, despite their firepower tearing through the hulls of capital ships, destroying large groups of Republic forces, pulverizing large cannons, and forcing back a seven strong Jedi strike team led by Vodo-Siosk Baas, Arca Jeth, and Nomi Sunrider. Revan had fought plenty of Basilisks during his campaign against the Mandalorians. (MW) Revan was an unrivaled warrior on the battlefield, quickly killing anyone he came across. "As a Jedi, Revan was a warrior who slaughtered armies. As a Sith, Revan was a teacher who trained a thousand dark apprentices." "Well, I wasn't there, thankfully. But I heard what he was like during the Mandalorian Wars, and it sounded like he was quick to wipe out anyone who crossed him." "There weren't many people able to face Revan across a battlefield and survive the encounter." "In one battle above the world of Althir, my unit managed to defeat a force of Althiri ten times our own size. That battle gained me command of an entire sub-sect of my clan. Ha! I was the best! Except for Mandalore of course. He was the only person alive except Revan who could have beat me." (MW) Revan easily defeated Mandalore the Ultimate, the greatest of all the ancient Mandalores. Realizing defeat was inevitable, Mandalore the Ultimate had challenge Revan to single combat, and Revan had accepted. Though the Mandalorian fought valiantly, in the end he was no match for the Jedi Order's most powerful champion. "Mandalore himself was killed at the hands of the Jedi Revan. The best of us could not defeat him!" > "Of the ancient Mandalores, we hold none in higher esteem than Mandalore the Ultimate, the Great Shadow Father of our clans." > "Mandalore: the title reserved for the greatest warrior in the galaxy, a warrior worthy to lead the Mandalorians." > "The Mandalorians would accept only a truly exceptional warrior and battlefield commander as their leader, so anyone seeking the title must have a proven history of victories and a definitive plan for new conquests to unite the Mandalorian clans." (MW) Revan was the greatest warrior in the Galactic Republic's history, according to Canderous Ordo. "Yeah, we lost. But there is no shame in it. We lost to the greatest single warrior the Republic has ever known." "You, Revan, are the single greatest warrior of this age, and any battle we fight will bring me honor." (UR) Revan and Darth Malak destroyed Rakatan raiding parties, including rancors. "And when my scouts told me of a great warrior from the sky slaughtering our raiding parties with mysterious powers and magics, I knew you had at last returned!" "They tried to take you prisoner, but you unleashed your magic - what you called the Force - upon them. Seeing your power they bowed before you and brought you here to me." "You have used strange magics and weapons to slaughter our raiding parties, interloper. You have bathed in the blood of fierce Rakatan warriors. You are the great warrior now, it seems. You came before and defeated us, and now do so again." (UR) Revan defeated an Underlurker, a dark side abomination native to Yavin IV. "I have faced such beasts before, but never one this strong with the dark side." (JCW) Revan slaughtered armies of Echani, renowned for their speed and battle precognition. "The Echani rely heavily on hand-to-hand combat and personal shield technology, and they had their asses handed to them by Revan during the Jedi Civil War, because, not surprisingly, there weren't many people able to face Revan across a battlefield and survive the encounter. The greatest among the Echani are said to be able to read their opponent's moves so well they can predict the path of a battle several seconds, sometimes even minutes in advance, by gauging their opponent's fighting style, heart rate, and their movements in combat. In many ways, the Echani see combat as a rapid dejarik game, calculating feints, attacks, and dodges with a speed that few can surpass." "It is the way of the Echani to be able to read their opponents - to know where an opponent is going to strike before it connects, anticipate it, and then strike against them. Echani battles are fought several minutes in advance - in many ways, it is much like the game of dejarik played in the core systems. The most advanced among the Echani are able to predict the course of battles by months, and the most revered are said to be able to predict the path of wars. Only Revan ever demonstrated such a skill in war. And even as he slaughtered us, the Echani still respected him." "Yet with Revan, there was the same commitment, but it was a subtle thing, like weaving threads in a tapestry, or strokes upon a canvas. He spoke through battle and tactics in a way one could never do in words. He showed his heart at Malachor V, and finally at the end of the Jedi Civil War. I believe he was speaking to Malak in that final battle, though few knew it." (JCW) Revan easily defeated Yusanis, the greatest Echani who could fight minutes in advance. One of the most feared of Echani warriors active in the galaxy during the decades leading up to the Jedi Civil War, Yusanis was a decorated soldier and one of the greatest heroes of the Mandalorian Wars. Later, when Yusanis discovered that an Echani Senator had been killed by Darth Revan, he set out to confront the Sith Lord and bring him to justice. Despite his skills, Yusanis was quickly killed by Revan. Yusanis was the most famous of Echani warriors, fighting against oppression and villainy until encountering Darth Revan. Discovering that Revan had killed an Echani senator, Yusanis attempted to tell authorities but fell to the powers of the Sith Lord, despite his own impressive abilities and the cortosis weave inherent in all Echani vibroblades. > "The greatest among the Echani are said to be able to read their opponent's moves so well they can predict the path of a battle several seconds, sometimes even minutes in advance, by gauging their opponent's fighting style, heart rate, and their movements in combat." > The fight continued. Ben (Skywalker) realized that Cilghal was right. At every turn, Jysella predicted exactly where Barv would be. Sometimes she seemed to be two steps ahead. Ben had never seen that kind of Force anticipation, not even from his father. His skin crawled. He paid no attention now to the reporter's running commentary, only dimly aware of words like "so young and attractive" and "tragic family" and other bantha poodoo. He was much more interested in the fight. Author's note: According to Ben Skywalker, even Luke Skywalker, who he saw fight Darth Caedus, could not predict fights more than two steps ahead. In contrast, Yusanis anticipated battles minutes in advance. (JCW) Revan defeated Darth Malak, one of the most powerful Sith in history, cutting off his jaw. Malak sees Lord Revan as soft, resulting in a tension that culminates in a lightsaber duel; Malak loses his lower jaw to Revan's blade, necessitating a metallic jaw guard. Of the two traitorous Sith, Revan was the stronger. Malak grudgingly assumed the role of apprentice. "Revan was always the leader, the more powerful of the pair." > Many of the most powerful, terrifying, and notorious Sith Lords through history have been Human or near-Human, including Exar Kun, Darth Malak, Darth Bane, Darth Sidious, Darth Vader, and Darth Krayt. > "We were not the first to fall to the dark side, but we had more power than those before us. It came from elsewhere." "What do you mean? Came from where?" "Our oldest secret. Only we would know, we lords. Only we would know where our power came from." "Why? What is at this place?" "So much power. It is blinding. I remember so little." "I cannot, human. It is a secret of so long ago. I no longer remember. You who bristle with the Force, you must find this place. Or, have you? Or did you? Or, will you? Oh, so many images I see your heart, human Jedi. I see your power, your pride. You will find the old place, the dark place. And you will regret it." Author's note: Darth Malak was far more powerful than the Exiles, including Ajunta Pall and Karness Muur, based on their respective handling of the Star Maps and the Star Forge. The Infinite Empire constructed the Star Maps and the Star Forge by infusing self-repairing ancient technology with dark side energies. However, the Star Forge was a colossally larger [a], semi-sentient, and more potent dark side nexus compared to the Star Maps [b]. 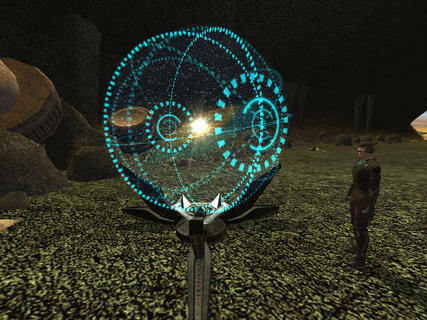 Nevertheless, the Exiles used the dark side energies of the Korriban Star Map as their central source of power. Ajunta Pall noted, “We were not the first to fall to the dark side, but we had more power than those before us. It came from elsewhere," identified the Star Map as ”where our power came from," revealed it was "our old secret," reflected that it had “so much power it is blinding,” and later warned Revan, "I see your power, your pride. You will find the old place, the dark place, and you will regret it.” In contrast, while the Exiles revered and fought over the Star Map, Darth Malak mastered and harnessed the full power of the Star Forge to three hundred percent its capacity, handling far greater amounts of power with far greater success. (JT) Revan meticulously mastered everything Kreia, Zhar Lestin, Dorak, and other Jedi Masters knew, learning faster than they could teach. At the end of his apprenticeship, Kreia mused he learned everything he possibly could from the Jedi, signifying mastery of the Force forms (i.e. Force affinity, Force mastery, and Force potency), sever Force, and everything within at least the Dantooine and Coruscant academies. > "Atris said that the Enclave on Dantooine was one of the great storehouses of Jedi knowledge. Many Jedi came here to study the ancient holocrons and relics." (MW) Revan plundered the great tomb-like cities of Malachor V, a planet-size archive of Sith knowledge. Unbeknownst to the Jedi Order, Darth Revan has discovered numerous Sith artifacts and holocrons, all stored in great tomb-like cities buried beneath Malachor V's surface. As Revan plundered these tombs and relics, he fell deeper into the Dark Side. He learned of the location and the true nature of Korriban, he learned of the location of other Sith artifacts, and he learned how those strong in the light side of the Force could be seduced and made to see the strength inherent in the Sith teachings. Revan knew he had discovered more than a staging area for the Mandalorian War - he had discovered an ancient, planet-sized Sith storehouse of knowledge. He had discovered a world that held one purpose - to teach and train others in the ways of the Sith. He had discovered a weapon that he could use against the Mandalorians, and a weapon by which he could convert more Jedi to his cause. Led by a woman named Kreia, the rogue Jedi turned to the dark side teachings uncovered by Malak and Revan. Kreia took the name Darth Traya, and her followers called themselves the Sith after the long-lost species that had invaded the Republic a millennium before. Revan travels to Malachor V and discovers the Trayus Academy, delving deeply into the Sith secrets contained within. Revan walked the halls of the Trayus Academy, using its knowledge to learn more of the Sith - and the presence of Korriban and other dark side worlds. (UR) Revan studied the ritual of Nathema, the most elaborate Sith ritual in history which drained the life force of eight thousand Sith Lords and the entire planet into Emperor Vitiate, writing a transcript of its procedure. From it, Revan created the thought bomb, another legendary ritual capable of annihilating tens of thousands of Jedi and Sith and trapping their spirits in a sphere of Force energy used in the Jedi Civil War and the Ruusan campaign. At the site of the thought bomb's detonation on Ruusan, the most powerful Force nexus in history was created, capable of granting a user drawing on it absolute omniscience. Once known as Medriaas, Nathema was an agriworld of the Sith Empire at the time when the Sith also controlled the Chorlian sector. An ancient Dark Lord of the Sith named Darth Vitiate destroyed all life on Nathema with a ritual designed to grant him immortality. A transcription of the ritual was recorded by Darth Revan and served as the inspiration for Lord Kaan's thought bomb on Ruusan. > Eight thousand Sith Lords gathered on Medriaas and agreed to partake in a ritual that would bind the Sith together as an ultimate dark side weapon. The ritual lasted ten days. Lord Vitiate orchestrated the sorcery and the planet Mediraas was consumed by the largest dark side nexus the galaxy would ever see. When the ritual ended, Lord Vitiate emerged as the only survivor. The pain, energy, and suffering of every living entity on the planet fueled his power and would prolong his life for centuries. The lifeless planet of Mediraas became a void in the Force and was erased from history. From that moment forward, the world would forever be known as Nathema, birthplace of the one and only Sith Emperor. > Rather than admit defeat, Kaan released the thought bomb. The wave of dark energy sucked dry almost all of the Force-users on Ruusan, desiccating and destroying their bodies, absorbing their souls into a huge black egg-like construct. > Jerec at last gained access to the valley, and for one lucid moment, absolute omniscience was his. The will of the Force, Chaos, the ancient civilizations of the Rakata and Xim, what lay beyond the galactic barrier, and the origins of the universe - Jerec understood them all, and endowed with Force powers beyond imagination, he would have ruled accordingly. (UR) Revan explored the Valley of the Dark Lords and drew knowledge from the Sith tombs. Two Jedi acquired a taste for rebellion during their victories in the Mandalorian Wars. They discovered pre-Republic Rakata artifacts that led them to the Sith tomeworld of Korriban. Despite their lack of connection to the Sith species, they drew knowledge from the Sith tombs and declared themselves to be the new Dark Lords of the Sith: Darth Revan and Darth Malak. On Korriban, the Revanchist uncovered the lost secrets of the Sith and became the heir to an ancient and evil legacy. After the Mandalorian Wars, Alek and Revan subsume themselves in Korriban and Malachor V's Sith occultism. (UR) Revan steeped himself in the teachings of Exar Kun's Brotherhood of the Sith. While in the Unknown Regions, Revan and Malak steep themselves in the teachings of those Sith who had been defeated in the Great Sith War. (UR) Revan created a Sith Holocron that far surpassed the New Sith War era's Korriban Sith Academy's entire archives. Many of the rituals were so dangerous that Darth Bane could hardly comprehend their potential and doubted he would ever dare to use them. One of the lesser rituals merged a group of Sith's minds together to unleash a sweeping inferno capable of ravaging a planet and devastating armies of Jedi. To Bane, it seemed the teachings contained within the single Holocron surpassed those of the Academy's entire archives. Revan had discovered many of the rituals of the ancient Sith, and as the Holocron's avatar explained their nature and purpose, Bane could barely wrap his mind around their awesome potential. Some of the rituals were so terrible - so dangerous to attempt, even for a true Sith Master - that he doubted he would ever dare to use them . . .
And there was far more than just the ancient practices of dark side sorcerers stored inside the Holocron. In only a few short weeks he'd learned more about the true nature of the dark side than he had in all his time on Korriban. Revan had been a true Sith Lord, unlike the simpering Masters who bowed to Kaan and his Brotherhood. And soon all his knowledge-his understanding of the dark side-would belong to Bane. He had discovered the ritual she spoke of while studying Revan's Holocron: a way to unite the minds and spirits of the Sith through a single vessel so their strength could be unleashed upon the physical world. > Darth Bane brought the self-proclaimed Sith Lords together, showing them how to focus their dark-side energy into a lethal blast of power that scoured the surface of Ruusan, leaving vast tracts of land barren and lifeless. Most of the Sith, Jedi and allies on both sides were utterly destroyed, yet still the wave of fire and destruction pushed onwards. This section is also known as Force bonding, Force chain, or Force kinship. (JT) Revan was a master at forming connects with or altering the life force end environment around him. "Revan said that many Jedi have the capability to form connections to life around them, although few of them realized the extent to which this is possible. I believe my Master speculated that many Jedi did not fully form such connections because of their discipline, because they never opened their lives to the passions around them." "Yes, such bonds are a connection that can be formed at moments of crisis - or in the slow understanding that grows between master and apprentice. It is most common between two beings who are sensitive to the Force. It allows the transmission of feelings, of influence. It was something you were gifted with, as I recall, before your fall. You formed such attachments easier than most - even to those who could feel the Force only faintly. Even Vrook could not ignore it, which is saying something. That is most unusual - and unnatural. I have never heard of a bond of such strength. There were a few within the Order who knew more than I did of such bonds - but their students were few, lost in the Mandalorian Wars. It was rumored that Revan studied such bonding deeply, both through the Jedi histories and with certain teachers, before he left the Order and went to war." (MW) Revan fed off the corrupt dark side energies of Malachor V.
The reason for this soon becomes clear as Revan is almost devoured by primal Sith forces on the world's surface. Revan's will allows him to feed on (and not be consumed by) the power of the dark side. (JCW) Revan trained the Sith Assassins in drain force, a variant of Force drain that drew upon someone's connection to the Force and fed upon such link - and then the death that followed. "So Revan trained elite Sith units into assassination squads, whose duty was to go out and capture enemy Jedi. I was in one of the special units trained to do this. Revan had plans for all Jedi. I think it was important that the Jedi see her side of things, the Sith teachings. Revan wanted to break them. And then have them join him." "The sect of assassins that chase you feed on the Force . . . Those Sith assassins can sense their prey through the Force - it is like a hunger. They feed, and grow stronger, when they are near Force Sensitives. The stronger their prey is in the Force, the deadlier they become." > During the Jedi Civil War, many Jedi fell at the hands of Sith assassins, using techniques in the Force the Jedi could not defend against. (JCW) Revan was a master of drain life, a variant of Force drain that siphoned the life energy of another. "Drain Life: A delicate procedure that saps the life energy of another and funnels it directly into your own essence. It is extremely difficult to employ in combat and is derived from the teachings of Zelashiel the Blasphemer in the Holocron of Darth Revan." This section is also known as mind trick, mind control, affect mind, alter mind, dominate mind, Force persuasion, Force illusion, mindform, Qâzoi Kyantuska, suppress thought, or mind probe. (MW) Revan drew upon the dark side energies of Malachor V to affect thousands of Mandalorians. Revan develops an evil but brilliant plan: Using the dark power of Malachor V, he will seduce an army of Jedi, completely loyal to him alone. He will then turn the planet's evil power against the Mandalorian army in battle, luring them to his stronghold and destroying them completely . . . Revan is able to draw upon the dark side energies of the planet below and use it during the battle, destroying the Mandalore and ending the Mandalorian threat. Revan used the Trayus Academy to influence the battle above Malachor V, using its power to affect the tide of battle and corrupt others to the Sith. Author's note: The underlined segment notes Revan actively turned Malachor V's power on the Mandalorians, not that the planet's passive influence affected them. While the Jedi may have been passively corrupted, that is because Revan gradually eroded their wills across the Mandalorian Wars in preparation for such. (★ UR) Revan dominated over a thousand Rakata, a species biologically resistant to telepathic persuasion, ripping the Rakatan language from the Black and Red Rakata tribes (also known as: drain knowledge or language absorption) and driving Basic into all their minds so that they could speak with him. "You used your power to rip the Rakata language from my mind, even as you drove Basic into our skulls so we could help you in your quest to find something called the Star Forge." "You used the Force to draw the Rakata language for our minds, even as you planted Basic into our skulls so we could help you in your quest to escape the world." > "Driven by portents and omens, we came to this island with a thousand of his finest warriors, and here we stay." > "Over time, we lost our ability to use the Force. Some believe we had used the Force for so long we evolved biologically, and became immune to its effects." > You learn about your previous visit, how the Rakatans speak the language of Basic, the history of the Elders, and more. > "These creatures have become such an irritation that every time I see one I want to strike it down with my lightsaber. Be that as it may, I interviewed a Toydarian subject who showed a great amount of resistance to Force suggestion, up to the point that I created physical discomfort. I found that they can be easily intimidated by a demonstration of strength. And it proved relatively simple to cause it to expire, merely by making its existence extremely painful. Ultimately, though it showed a great degree of willpower, it was no match for the power of the Force." Author's note: All evidence indicates Revan affected the totality of the Rakatan population. Every Rakatan shown in Knights of the Old Republic spoke Basic, the wordage of the Official Strategy Guide suggests "the Rakatans" in general terms, not just select members, spoke Basic, and there is no reason why a few Rakatan would have trained the others how to speak the language: the Black Rakatan were barbarians that instantly slaughtered all offworlders and the Red Rakatan were isolationists with no relations to the Sith Empire. Author's note: In contrast, Darth Vader could not mind trick a single Toydarian without physical torture. This section is also known as Force shield, Force war shield, Force armor, Force guard, Force protection, Force resistance, Force immunity, Force bubble, Force protection bubble, or bubble of safety. (JCW) Revan resisted the drain life effects of the Star Forge, which devoured lesser beings. There is no one left with the power to control the Forge, though many have tried. I have watched them be devoured, their life drained from them as they attempt to tap into its power. Knowing what we do of the Builders and their fate, I'm convinced that Revan did not intend us to keep the Star Forge - to use it would mean the end of the Sith, the end of the Force. This section is also known as Force stealth or buried presence. (MW) Revan concealed his dark power from thousands of Jedi. This single student (Meetra Surik) has left behind the relative safety of the training grounds to fight alongside the Jedi loyal to Master Revan. But this young one, like the other Jedi brethren, is unaware of the tremendous dark side power wielded by Revan and the terrible secrets of Malachor V.
(JCW) Revan knew how to purge poison and disease from his system. Revan's Sith Holocron taught the technique to Darth Bane, who used it to stay alive despite intaking three lethal doses of poison. "Revan had shown him how to use the Force to ward off poison and disease. No simple toxin should be able to affect anyone strong enough in the dark side to be a Lord of the Sith." This section is also known as Force valor, enhance ability, Force mind, burst of speed, burst run, Force run, Force sprint, heightened speed, Force dash, Force quickness, or surge. (JCW) Revan was faster than Yusanis and armies of the Echani, renowned for their speed. "If Father had been faster, if only Father had been faster." "The Echani rely heavily on hand-to-hand combat and personal shield technology, and they had their asses handed to them by Revan during the Jedi Civil War, because, not surprisingly, there weren't many people able to face Revan across a battlefield and survive the encounter . . . In many ways, the Echani see combat as a rapid dejarik game, calculating feints, attacks, and dodges with a speed that few can surpass." (JT) Revan accurately foresaw many aspects of the Mandalorian Wars. "Actually, Zayne, that's what I wanted to tell you. Everything my master foresaw about the Mandalorians was true. They have all the force they need to overrun the Republic. We saw the ships with our own eyes." "Where is your master? I didn't see -"
"Left to investigate another vision, just before we got nabbed. This one pointed to Dxun, where the Sith War Mand'alor fell years ago. Maybe Dxun represented the Mandalorians in general - or maybe something worse. The important thing now is to warn the Order and the Republic." (MW) Revan resisted, then fed off, the dark side energies of Malachor V, which later corrupted hundreds of Jedi, including Kreia, by drowning them in the dark side and stripping them of their identity. The reason for this soon becomes clear as Revan is almost devoured by primal Sith forces on the world's surface. Revan's will allows him to feed on - and not be consumed by - the power of the dark side. > Jedi Master Kreia, Revan's old mentor, is still haunted by guilt, wondering whether it was her teaching that resulted in Revan's fall to the dark side, and begins to search for him. Sensing his last location, she travels to Malachor V, but is unable to shield her emotions, and is completely consumed by the dark side of the Force. She is lost to the Jedi, spending the next several years on Malachor V, learning its secrets, and eventually becoming The master of the Sith academy there. > "There is a place in the galaxy where the dark side of the Force runs strong. It is something of the Sith, but it was fueled by war. It corrupts all that walks on its surface - drowns them in the power of the dark side. It corrupts all life, and it feeds on death." (UR) Revan broke free from Emperor Vitiate's mind control soon after he left on Dromund Kaas. The Hero of Tython later reflected that he and Revan were the only Jedi to accomplish such a feat. The supreme and horrifying power of the Emperor corrupted the Jedi and completed their fall to the dark side . . . Revan and Malak scoured the galaxy and ultimately discovered the Star Forge. But instead of delivering it to the Emperor, Revan seized the Star Forge for his own use. With Malak by his side and the Star Forge supplying his fleet, Revan formed a new Sith Empire and prepared to conquer the Republic. Only by uniting the galaxy under his rule could Revan hope to defeat the threat posed by the Emperor. "The Emperor immersed me in the dark side. Darth Revan was the only other Jedi to come back from that." Author's note: There are many misconceptions about Revan's first confrontation with Emperor Vitiate. First, the Emperor did not corrupt Revan to the dark side; Revan willingly embraced the dark side on Malachor V, amassed "tremendous dark side power," and converted his followers into "Sith assassins" three years beforehand. Sources that suggest otherwise are in-universe and do not override out-of-universe works like Chronicles of the Old Republic. Second, the Emperor did not easily dominate Revan to his faction; an Imperial Guardsman told the Emperor about Revan's plan "months" in advance. Revan noted the Emperor was "ready and waiting" for the fight and attributed this preparation as the central reason of his defeat. Third, Revan was wrong that he blocked out the memory of the Emperor and the Sith from his mind; Revan fought the Jedi Civil War to unite the galaxy to stop the Emperor. This error can be attributed to Revan's jumbled memories. (UR) Revan resisted the effects of Nathema, which created a sensation of one's body discorporating into trillions of subatomic particles that scattered across its surface. Meetra Surik, who endured the wound in the Force created by Malachor V and carried it with her, nearly went insane after a short exposure. He knew with absolute certainty that he had been to this world before. He remembered its deserted city and its lifeless surface. He remembered searching the empty buildings with Malak, looking for archives, records, and astrogation charts that would guide them on the next step of the journey. But most of all, he remembered the horror of a dead planet entirely stripped of the Force. > The entire process took less than five minutes, but for Meetra it might as well have been an eternity. She had managed to keep busy up until this point, but while waiting idly by for T3 to finish she began to notice the absence of the Force once more. The affirmation of her own existence seemed to push the Void back, at least for the moment. But Meetra knew she couldn’t hold out against it much longer. As much as she tried to ignore what she felt more - more precisely, didn’t feel - all around her, she knew it was only a matter of time until the horrors of Nathema stripped away her sanity . . .
Once she was in motion she felt better, but she could still sense the Void hovering on the fringes of her awareness. It was like being stalked by some nameless, faceless, invisible creature. She felt it lurking around every corner, just waiting for her to let her guard down so it could take her. She quickened her pace, trusting her droid companion to keep up, too intent on keeping a grip on herself to reply to his indignant chirps. By the time she reached the Ebon Hawk she was running, though she wasn’t even aware of it. One single thought dominated her conscious mind: Escape! (JCW) Revan reactivated and controlled the Star Forge, a semi-sentient dark side nexus that corrupted and consumed inferior beings, to produce an infinite armada (see also: I/Combat_abilities/JCW/3). "There is no one left with the power to control the Forge, though many have tried. I have watched them be devoured, their life drained from them as they attempt to tap into its power." (JCW) Revan could overcome a sever Force attack by the Jedi Exile, according to Chris Avellone. > "It is difficult. And it is the most devastating attack possible using the powers of the light side. To block a Jedi from the Force - even a Dark Jedi - is a terrible thing." (★ JCW) Revan was the greatest practitioner of battle precognition, an instinctual and tactical ability that predicted attacks before they happened. The greatest of the Echani, which Revan surpassed and killed, could predict attacks minutes beforehand, the course of battles by months, and the path of wars. "The Echani rely heavily on hand-to-hand combat and personal shield technology, and they had their asses handed to them by Revan during the Jedi Civil War, because, not surprisingly, there weren't many people able to face Revan across a battlefield and survive the encounter. The greatest among the Echani are said to be able to read their opponent's moves so well they can predict the path of a battle several seconds, sometimes even minutes in advance, by gauging their opponent's fighting style, heart rate, and there movements in combat. In many ways, the Echani see combat as a rapid dejarik game, calculating feints, attacks, and dodges with a speed that few can surpass." "I always felt Revan was an incredible tactician, and the Echani were awed by his precog[nition] and natural skill with tactics." Author's note: According to Ben Skywalker, even Luke Skywalker, who he saw fight Darth Caedus, could not predict fights more than two steps ahead. In contrast, Revan anticipated battles minutes in advance. BL (Before the Leviathan) - Revan's mind was wiped by the Jedi Council, and he was retrained and sent out to find the Star Forge, the source of the Sith Empire's fleet. Revan traveled to Tatooine, Kashyyyk, and Manaan until Darth Malak revealed his identity on the flagship Leviathan (3956 BBY). AL (After the Leviathan) - Revan escaped the Leviathan, destroyed the Korriban Sith Academy, and located the Star Forge, but Darth Malak captured and corrupted his lover Bastila Shan (3956 BBY). SF (Star Forge) - Revan assaulted the Star Forge, defeated armies of dark side warriors and battle droids, redeemed Bastila Shan, and killed Darth Malak, saving the galaxy (3956 BBY). DW (Dark Wars) - Revan was captured in the Unknown Regions searching for Emperor Vitiate; meanwhile, remnants of Revan's Sith Empire purged the galaxy (3955 BBY to 3951 BBY). R (Reborn) - Revan fully recovered his lost memories and confronted Emperor Vitiate, but he was betrayed, imprisoned, and tortured by the Emperor for three centuries (3951 BBY to 3642 BBY). EMPEROR VITIATE was described as “the most dominating Force-user the galaxy has ever seen," “the most powerful Force-user who has ever existed,” “history's most powerful dark side master,” "a being of unfathomable power," and “a mysterious, almost godlike avatar of the dark side." The Emperor achieved incorporeal immortality and unprecedented dark side powers after consuming the life force of eight thousand Sith Lords and the planet of Nathema in an elaborate Sith ritual, then further honed his abilities and studied the most uncharted and dangerous Force practices for over a millennium in isolation. (BL) Revan had greater Force potential than any Dantooine Jedi Enclave student, including Exar Kun. "The Force flows through you like no student we have ever seen." "Yet even though you are a mere apprentice, your potential is unlimited - and your progress amazing. In all my years, I have never seen one who has mastered the initial training so quickly. You done in weeks what many cannot do in years." > The Jedi enclave on Dantooine is one of the oldest enclaves and academies in the Order . . . At the same time, many of the era's worst dark siders come from the enclave, including Exar Kun, Darth Revan, and Darth Malak. (BL) Revan became far stronger than Bastila Shan, the greatest Force prodigy of her generation. "You're stronger than I am, and there's no point in telling me otherwise. You will be a great Jedi, I think. I hope. I can't deny that there are parts of you I am drawn to. Your power, your will. You are so much stronger than I am. In some ways you make me feel weak, like I am caught up in the wake of our destiny. But at the same time, you make me feel stronger, more alive." (AL) Revan was radiating with the Force, according to Ajunta Pall. "You - the Force is with you. So strong, so bright." (SF) Revan surpassed the powers he wielded as Dark Lord of the Sith. "You are stronger than I thought; stronger than you ever were during your reign as the Dark Lord. I did not think that was possible." (SF) Revan may have became invincible with the power of the Star Forge, according to Darth Malak. "You continue to amaze me, Revan. If only you had been the one to discover the true power of the Star Forge, you might have became truly invincible." (DW) Revan was far more powerful than anyone Scourge had ever sensed, including Darth Nyriss. The Jedi's command of and connection to the Force was unlike anything Scourge had sensed in anyone else. Even though Revan was constantly drugged, it was impossible not to sense his strength. "If anyone had the strength to stop the Emperor, it was this man." (R) Revan grew far more powerful since the end of the Mandalorian Wars. Revan had grown since then. He was far more powerful now, but was he a match for the Emperor? (R) Revan had the power to dominate worlds, according to Darth Malgus. "What do we know about the Jedi Master and this space station?" (R) Revan and Meetra Surik were the greatest heroes of the Jedi Order. "For a time I worked with the greatest of your Jedi heroes: Revan and the Jedi Exile." "Revan was both Jedi Master and Sith Lord. His student, the Exile, defeated the Sith Triumvirate. They were your greatest heroes." (R) Revan was one of the most powerful Force users in history. "Revan was one of the strongest Force-wielders ever." "The Bane trilogy focused on Darth Bane, one of the most powerful Sith Lords who ever lived. Revan obviously focused on Revan, another incredibly powerful Force user . . . As much as I loved writing about all-powerful Sith and Jedi . . . Unlike Revan or Bane, [Theron Shan] isn’t one of the most powerful individuals in the universe." (AL) Revan obtained the holocron of Tulak Hord, the greatest duelist of the ancient Sith Lords that defeated armies of Jedi, which contained knowledge of his secret and unique lightsaber technique. "This was the tomb of Tulak Hord, known as the greatest lightsaber duelist of the Sith Lords. His skill was considered remarkable even in his time, when many true lightsaber masters lived. Supposedly he created a holocron to teach his technique to other Sith. The holocron would have been laid to rest in his tomb. Unfortunately, Tulak Hord's tomb was among the first penetrated by the graverobbers of the new Sith order. If the holocron has survived, I doubt anyone living would know its location." Tulak Hord was buried within his tomb along with his secret teachings. The Jedi Revan later desecrated the tomb and stole untold artifacts during the Jedi Civil War. This small crystal supposedly holds holographic recordings of the ancient Sith - information which could be incredibly valuable. > "Kreia is setting the stage for what we imagined KOTOR3 to be, and as we had a sense for the power that we wanted those Sith Lords to reveal, her predictions are accurate. And yes, she had a number of Sith holocrons that she had read (the ones on Telos)." Author's note: Revan either gave the Holocron to Uthar Wynn for prestige points or kept it for himself. It is far more likely Revan kept the artifact to advance his studies of balancing the Force than that he gave it a Sith he would soon fight. Even if he did give it to Uthar Wynn, Revan later looted his body and living quarters. (AL) Revan defeated two terentatek, alchemically warped Sithspawn highly resistant to Force attacks and individually capable of matching a squad of Jedi, simultaneously on Korriban. The same two terentatek killed Duron Qel-Droma and Shaela Nuur, the Jedi Order's greatest terentatek hunters, decades earlier. > Because a single terentatek was a match for an entire squad of Jedi, the extermination of terentateks was the Order's highest priority in 3993, three years after the end of the Sith War. > Few creatures in the galaxy are as deadly as the legendary terentatek. These beasts cut imposing figures; their hulking frames are covered in an array of spikes, and each is armed with tusks and claws that deliver lethal venom. Their prowess and hostility are well-known throughout the galaxy, but perhaps the creature’s most impressive quality is its hide, which is highly resistant to Force attacks. This exceptional defense, combined with its raw power and violent nature, makes the terentatek formidable even to teams of the most skilled warriors. (AL) Revan defeated Uthar Wynn, the headmaster of the Korriban Sith Academy, and Yuthura Ban, his greatest student out of hundreds, directly after the aforementioned feat, simultaneously. Wynn and Yuthura attacked the Jedi, but both were defeated in combat. > "But, what if Master Uthar is dead? How can we hope to stand up against someone who could kill him?" > "[Yuthura Ban's] one of the most powerful Sith in the academy." (★ AL) Revan slaughtered the Korriban Sith Academy, consisting of hundreds of Sith apprentices plus many Sith masters and Sith shock troopers, completely driving the Sith Empire from their capital world, directly after the two aforementioned feats. The battle was remembered by Darth Bane three thousand years later. You have to fight through the entire Sith Academy, starting with the Sith apprentices in the valley. Nearly three thousand years had passed between the time the Sith had been driven from Korriban by Revan, and the day Kaan's Brotherhood of Darkness officially reclaimed this world for the order. > The Sith Training Academy was located on the outskirts of Dreshdae, close to the Valley of the Dark Lords. It was a place where Sith were trained in a similar manner as the Jedi, with hundreds of students receiving instruction from Sith Masters. (AL) Revan slaughtered over a thousand of the finest Black Rakata before defeating the One, one of the greatest Rakatan warriors, his elite Rakatan warrior guards, and four rancors simultaneously. (SF) Revan boarded the Star Forge and destroyed all its stationed defenses. First, Darth Malak ordered the Star Forge's battle droid army, individually capable of disintegrating large doorways [a] and equipped with flamethrowers, stun rays, heavy repeating blaster, and environmental energy shields, to stop him. Later, Darth Malak mused the force could have defeated any Jedi in the Order besides Revan. "Send the Star Forge's battle droids to deal with them." "Lord Malak, forgive me, but how can mere droids be a match for the Jedi?" "You underestimate the power of the Star Forge's droid army. Dispatch the droids." "I have news, Lord Malak. About the Jedi." "Ah, the Jedi. Did my droids pass their test? Did they destroy our enemies?" "No, Lord Malak. The droids could not stop them." "Strange. I did not think there were any among the Order who could survive an attack by an army of the Star Forrge's battle droids." "It - it was Revan. Your old master is with the Jedi, here on the Star Forge!" "Yes, that would explain why the droids failed." Next, Darth Malak sent all his dark Jedi and Sith apprentices, highly skilled lightsaber duelists proficient in telekinesis, drain life, Force shock/lightning, Force fear/insanity, Force slow/plague, and Force stasis, along with Sith shock troopers, chain gun turrets, ion defense turrets, and heavy defense turrets, to impede Revan's progress. When even a small group of dark Jedi combined their abilities, they rendered a large doorway immovable with "a great power" until they were killed. However, Revan slaughtered through three floors of "countless" upon "countless" attackers for over an hour until they were all defeated. "Revan was always strong in the Force. Very well - sound out all available troops. The apprentices, as well." "Do you - do you think they can stop Revan, Lord Malak?" "Of course not! But they will slow Revan down. That will give me the time I need to fully prepare the Star Forge's defenses." Darth Malak requests a progress report from his retainer. He then learns that his former master is among the strike teams currently invading the Star Forge, and he’s about to arrange a surprise for Darth Revan. For now though, he orders all his apprentices into battle against you! The next hour is spent frantically blasting, swiping, and crushing countless Dark Jedi and Sith heavy weapons and elite troopers on your way through the decks of the space station . . . Here you encounter a large number of Dark Jedi crowding this thin, lit walkway. Wade into the fray and execute a number of techniques of your choosing, cutting a swath through the assembled troops until all have fallen. Once on Deck 2, take another slog through countless groups of Sith troopers and Dark Jedi. Continue with the melee fighting as you round a corner, and fight to a lower ramp and the rejoining of the two exterior corridors into a pathway leading directly south. Slash and blast through more foes, open another huge blast door, and repel yet more of Malak’s troops before entering the tunnel and emerging into a gigantic central chamber . . . However, you should be more concerned with the heavy Sith guard in the vicinity. Stay at the entrance until all of them have been dispatched, and then make a left turn, heading directly east. When the turrets have been disarmed, you need to worry about only the humanoid foes . . . The command deck looks very much like the previous decks you’ve battled through. Start by fighting to the large main walkway, and continue down it to the first doorway. Enter it, heading east, open another doorway, then follow the ramp northward and up, then east to another door. During this time, Sith apprentices, Dark Jedi, and the finest Sith shock troops are waiting to demolish your party. > The many wars of this era compel large numbers of Jedi to become experts in lightsaber and Force-related combat. Some become masters on the battlefield; others highly skilled duelists, able to battle dark Jedi and Sith in single combat. Then, Revan easily defeated Bastila Shan, the greatest Force prodigy of her generation, three consecutive times since her life force was continually replenished by the Star Forge's dark side energies. "Here on the Star Forge the power of the dark side is at its strongest. This time you will not defeat me." "The light side is failing you while the power of the Star Forge re-energizes me. Soon this will all be over." "I have not faltered, Bastila. You have been misled by the dark side." "The dark side will always triumph over the light! Malak has assured me of victory! You can't defeat me here on the Star Forge! You can't!" "No, this is not possible! You have rejected the dark side, you are a weak and pathetic servant of the light! How can you still stand against me? Why can't I defeat you?" "Now you see the dark side is not stronger than the light." "Yes, I see you speak the truth. I am no match for you." > Bastila Shan is the quintessential Jedi: trained from a very young age and gifted with a natural ability with the Force that has given her both renown and considerable pride. Finally, Darth Malak unleashed the full potential of the Star Forge's defenses upon Revan, summoning an "infinite army" of battle droids. Malak prepared the force during the entirety of Revan's assault on the Star Forge, believing the threat it posed exceeded armies of Sith or Bastila Shan. After Revan deactivated the droids, Darth Malak was so impressed that he abruptly changed his belief that Revan was a shadow of his former self and "an insignificant speak beneath [his] notice" to admitting, "You are stronger than I thought; stronger than you ever were during your reign as the Dark Lord. I did not think that was possible." "That will give me the time I need to fully prepare the Star Forge's defenses. I am curious to see the true extent of this space station's capabilities. One as my old master will make an interesting test subject." "Perhaps you will triumph, Bastila. But even if you fail it will give me the time I need to complete my preparations of the station's defenses. And then we shall see if Revan can stand against the full fury of the Star Forge!" "I have unleashed the full potential of this Rakatan factory! . . . And now, my old master, I will let the Star Forge itself destroy you!" (★ SF) Revan killed Darth Malak, a Dark Lord of the Sith with powers far greater than Exar Kun or Freedon Nadd when empowered by the dark side energies of the Star Forge, directly after the aforementioned feat. > An imposing figure with ghostly pale features, prominent Sith tattoos, a gleaming red lightsaber, and devastating Dark Side power, Malak struck terror into the hearts of his former allies. He also wore a vocal mask that may have concealed a form of cybernetic life-support. Did it provide him with powers far greater than even Exar Kun or Freedon Nadd, or was cybernetic enhancement too simple an explanation? > "You made a mistake coming here, Revan. The Star Forge fuels my command of the dark side. You are no match for me here . . . I have surpassed you in every way and accomplished what you never could: I have unleashed the full potential of this Rakatan factory! You had no idea of the power within this place! Its very walls are alive with dark side energies!" Revan had to defeat Darth Malak multiple times consecutively because Malak replenished his life force by draining the Force energy from eight chained Jedi captives, making Malak nearly unstoppable. The Sith Lord had grotesquely adapted the Rakatan device to draw energy directly from chained Jedi captives. He replenished his life force from the captives by draining theirs. Malak was nearly unstoppable, but the Republic emerged from that epic conflict victorious, as the Star Forge was eventually destroyed. > "The Star Forge is more than just a space station. In some ways, it is like a living creature. It hungers. And it can feed on the dark side that is within all of us! Look around you, Revan. See the bodies? You should recognize them from the Academy. These are Jedi who fell when I attacked Dantooine. For all intents and purposes dead, except for one difference: I have not let them become one with the Force. Instead I have brought them here. The Star Forge corrupts what remains of their power and transfers the dark taint to me! You cannot beat me, Revan. Not here on the Star Forge. Not when I can draw upon the power of all these Jedi!" (DW) Revan was an incredible lightsaber duelist and primarily used a unique form of Niman, drawing on traits of all the seven forms. This adaptable style allowed him to best maximize his powers in battle. "Revan's a master tactician, and he's kind of a genius, and an incredible lightsaber wielder." "I've always seen Revan as more of a generalist, drawing on bits of everything (the lightsaber forms) here and there. Revan would generally have used Form VI - Niman. This form works well for anyone who is intelligent and adaptable, as Revan obviously was. It has no real weaknesses, and even though it is not as aggressive as other forms it enables the user to unleash powerful Force abilities more easily during combat. Revan was skilled in lightsaber combat, but knew true strength came from using all the other Force abilities in conjunction with lightsaber combat." (DW) Revan could defeat Darth Traya, who telekinetically dominated and drained three Jedi Council members, and Meetra Surik, who killed Darth Sion and Darth Traya on the dark side nexus of Malachor V, simultaneously. Revan could also defeat Meetra Surik, despite Atris, "a master of lightsaber combat," being "no match for the Jedi Exile's lightsaber prowess," in pure lightsaber combat. (R) Revan instantly destroyed Darth Nyriss with his Force powers, a senior Dark Council member far more powerful than Meetra Surik or Scourge (see also: II/Tutaminis/R/1, Revan's Raw Power Overview blog). “Did you think I would be as easy to defeat as Xedrix?” Nyriss shouted, raising her lightsaber triumphantly above her head. The air around her began to crackle and grow hot as she gathered herself for the killing blow. Scourge felt the energy building inside her, and he knew he would be powerless to stop it. Nyriss was too powerful; her command of the dark side was too strong. Scourge braced himself for the end. Just then, Revan emerged from the cell. He had pulled the hood of his Jedi robe up to cover his head, and he wore the red-and-gray mask, hiding his face. A dozen bolts of lightning sprang from Nyriss’s hand, arcing across the room to incinerate her enemies. Instead of leaping back into the cell to avoid the deadly attack, Revan stepped forward to intercept it. Both hands were held in front of him, his arms fully extended at shoulder height, his thumbs touching and his fingers splayed wide. He drew the bolts of lightning into his waiting grasp, channeling them away from their intended targets and absorbing their power. Nyriss’s eyes went wide as Revan unleashed the power of her own attack against her. She tried to throw up another Force shield, but the bolts ripped it apart and continued on unabated. The lightning engulfed her, the intense heat consuming her instantly, leaving only a pile of charred ash. Revan's raw power in the Force bends Nyriss' Sith lightning back at her, utterly destroying the Sith Lord. Author's note: This feat is combat-applicable because the conditions mirrored an actual fight. Revan instantly summoned enough power to absorb and reflect Force lightning that incinerated Darth Nyriss, indicating Revan could have gathered the energy to vaporize her with his own Force lightning in a split-second. (R) Revan defeated an Imperial Guardsman, "honed-to-perfection killing machines molded to the Emperor's will" trained to kill powerful Force users and challenged Meetra Surik for a period of time, in seconds. He came in with a high, overhand chop-obvious feint meant to draw the defenses of his opponent downward, leaving his legs exposed to quick slash follow up. The guard recognized the familiar ploy, countering it by parrying the overhand chop then quickly dropping his blade low to intercept the inevitable slash at his legs. Only Revan didn't go for his legs. Anticipating that his opponent's defenses would go low, he kept his blade up high, allowing him to end the battle with horizontal cut across the man's exposed throat. > The ultimate non-Force sensitive fighters in the Empire serve the Emperor and the Emperor alone . . . Fanatic in loyalty and unmatched in martial skill, even a lone Imperial Guard is a formidable opponent capable of standing toe-to-toe with a Jedi, or a Sith should the occasion arise. >"I fought the Imperial Guard on Corellia. They were dangerous opponents." "Among the most dangerous in the galaxy." (R) Revan nearly defeated Emperor Vitiate but was ultimately overwhelmed. First, Revan approached within striking distance of the Emperor and was largely unaffected by the Emperor's charged telekinetic attack (see also: II/Force_barrier/R/1). Next, Revan reciprocated with a more potent burst of energy that hurled the Emperor onto the floor (see also: II/Telekinesis/R/3) and resisted the Emperor's telepathic attack simultaneously. Revan proceeded to deflect four bursts of Force lightning with his lightsaber (see also: II/Force_speed/R/1), with the final striking and injuring the Emperor (see also: II/Tutaminis/R/2). Finally, Revan absorbed a vast amount of the enraged Emperor's Force lightning storm (see also: II/Tutaminis/R/3), then healed himself of the difference thanks to the distraction of his allies (see also: II/Force_heal/R/1). As Meetra and Scourge battled the Guard, Revan charged toward the Emperor. His opponent stood perfectly still, focusing and channeling his power. At the last possible instant, the Emperor unleashed a wave of energy that swept Revan off his feet and sent him flying backward. Revan twisted in midair so that he was able to roll with the impact when he landed. He quickly sprang back to his feet and advanced again, moving more slowly this time. The Emperor stood in the exact same position as before; it was as if he hadn’t even moved. Revan began to sense the oppressive presence of the dark side weighing down on him. The Emperor was trying to crush his will: to dominate and enslave his mind as he had before. This time, however, Revan was ready. Instead of charging forward, he opened himself up to the Force, letting both the light and the dark side flow through him like twin rushing rivers. But instead of focusing or channeling the Force, he released it in its purest form. There was brilliant flash as the air between the two combatants lit up. The energy unleashed was powerful enough to send Revan staggering. The Emperor, unprepared and with much of his strength diverted to his effort to dominate Revan’s mind, was sent flying backward. He landed in a heap on the floor and Revan raced toward him. The Emperor rolled over, lifted himself up on one knee, and his hands flew forward as he hurtled a bolt of dark side lightning at his enemy. Revan intercepted the bolt with the blade of his lightsaber, though the impact stopped his charge dead in its tracks. The Emperor unleashed three more bolts in quick succession. Revan batted the first aside with his lightsaber, ducked the second, then deflected the third back in the direction of its source. It struck the Emperor in the chest, sending him sliding several meters back on the floor. For the first time the Sith’s emotionless veneer cracked as he let out a primal hiss of hate. The sound sent shivers down Revan’s spine. After the battle, the Emperor established the Voice to guard against further vulnerability after Revan approached within striking distance of him and imprisoned Revan because he posed a legitimate threat. "For this, we just have to look at the last person who ever stood up to Vitiate at anywhere near the level that the player's character did on Ziost: Revan. When Revan took a crack at him, Vitiate locked him up for centuries, picking and prodding at his mind the entire time. So we know that Tenebrae/Vitiate/Valkorion doesn't destroy people who are a legitimate threat to him; he's fascinated by them. (He did it to Vaylin, too! And Dramath!)" Author's note: The underlined segment confirms Revan was a serious threat to Emperor Vitiate, similar to Vaylin [a] and Dramath [b], dismissing the baseless fringe opinion that the Emperor easily defeated Revan. (★ DW) Revan discovered how to balance both sides of the Force and called upon light side and dark side energies simultaneously. Revan applied Balance of the Force to release the Force "in its purest form" and amplify the potency of his powers (see also: II/Telekinesis/R/3, III/Altus_sopor/F/1, III/Telekinesis/FT/2). He had learned to balance on the knife-edge between them, drawing on both the light and dark sides for strength. "Revan is a powerful Force user who draws on both the light and dark side of the Force . . . I always felt that Revan was special because he learned to balance and call on both the light and dark sides of the Force." There has always been a dual nature to the legend of Revan. At his core, is he truly a Jedi or is he Sith? It has been a hotly debated subject among scholars and politicians for centuries. As one might expect, the conclusions reached by those from Republic-aligned worlds often differ from those of an Imperial bent–but not always. Some of the most knowledgeable authorities in the ways of the Force believe that it is right to call Revan a Jedi Knight and it is also right to refer to him as Dark Lord of the Sith. They contend that simultaneously knowing and embracing both the light and dark sides of the Force is possible, and point to Revan as potential proof. The technique is similar in description to elements of Oneness, although Revan could enter the state at will. > As his grandfather had done, he had broken through the apparent opposites that concealed the absolute nature of the Force, and found his way into an unseen unity that existed beyond the seeming separateness of the world. For a moment all the cosmic tumblers had clicked into place, and light and dark sides became something he could balance within himself, without having to remain on one side or the other. Such mastery is nigh-unreplicated by any other Jedi or Sith, besides perhaps Luke Skywalker. For example, Darth Gravid, a mid-lineage Banite Sith, was driven to insanity attempting to straddle and merge Jedi and Sith philosophy. Darth Plagueis ridiculed Darth Gravid in memoriam for attempting the impossible. > A human Sith Lord whose short reign had elapsed some five centuries earlier, Gravid had been persuaded to believe that total commitment to the dark side would sentence the Sith Order to eventual defeat, and so had sought to introduce Jedi selflessness and compassion into his teachings and practice, forgetting that there can be no return to the light for an adept who has entered the dark wood; that the dark side will not surrender one to whom, by mutual agreement, it has staked a claim. Driven increasingly mad by his attempts to straddle the two realms, Gravid became convinced that the only way to safeguard the future of the Sith was to hide or destroy the lore that had been amassed through the generations-the texts, holocrons, and treatises - so that the Sith could fashion a new beginning for themselves that would guarantee success. Author's note: The underlined segment was stated by Drew Karphysyn in response to the baseless fringe opinion that Revan could only use both sides of the Force while in a circumstantial moment of Oneness. (DW) Scourge likened Revan's understanding of the Force to Emperor Vitiate. The fact that they showed no concern over letting an armed Sith Lord speak to the Emperor face-to-face without any kind of preparation was a testament to the Emperor's unfathomable power. Thinking about that power gave Scourge pause. Like Revan, the Emperor understood the Force in ways Scourge never would. (BL) Revan mind tricked a Hutt, a species biologically resistant to telepathic persuasion. "I suppose you're expecting some payment now, huh? I'll give you 2000 credits for the box, and you can run on your way." "You want to pay me a little more." "Hmm. I will pay more, but I don't like it. Take your money and let me get back to race business." > You and your Master will probably run across a Hutt’s thugs long before you meet an actual Hutt, but don’t use mind tricks if you’re brought before their boss! Hutts are notoriously difficult to influence or read through the Force. Their elusiveness has been a struggle for the Jedi since our forebears left Tython. (DW) Revan amplified the fear of a Sith soldier while weakened by Force-suppressant drugs. Through the veil of drugs, he strained to reach out with the Force, amplifying the other’s fear and confusion. “No!” his friend shouted above the piercing alarms, still staying hidden around the corner. “He’ll kill us!" (R) Revan was imprisoned and bound to Emperor Vitiate's mind through Sith alchemy. Alongside resisting the endless torment and telepathic attacks, Revan waged a tireless mental war against the Emperor in turn, augmenting his fear of death and influencing him to postpone his planned invasion for three centuries. Revan played on the Emperor's caution and patience, constantly pushing them to the forefront of his enemy's mind. He augmented his irrational fear of death. At every opportunity he reinforced the idea that invading the Republic was reckless and dangerous. But when the Sith Emperor imprisoned Revan for more than three hundred years, Revan’s ambitions became focused as never before, seeking to use his affinity with the Force to secretly influence his jailer. "The darkness will consume all it touches. Stars will burn black, ashes raining on lifeless worlds. Everything ends. The prisoner holds the darkness at bay, lost inside it for three-hundred years." Across the mental war, Revan pulled centuries of knowledge from Emperor Vitiate's mind. "I learned a lot as his prisoner. Centuries of knowledge." After the war began, the Sith Empire quickly conquered half the galaxy. However, Revan forced Emperor Vitiate into abruptly ending the conflict and offering a peace treaty. Revan maintained the truce for eleven years until his powers finally subsided and he was freed from prison (see also: II/Willpower/R/1). Finally, the Emperor permitted the war to end in a truce - his ruthless tactics unknowingly calmed by his mental link with the Jedi Master Revan, a legendary Republic hero. When the Empire launched the Great War against the Republic, Revan used his connection to the Emperor to manipulate the Sith Lord into ending the conflict in a temporary peace, saving millions of lives in the process. "I convinced the Emperor peace was in his best interest. Tempered his hate." (AL) Revan and Merkel used drain life against Jorak Uln. "What?! Mutiny! Behave, students! That's it! Detention for all of you! Permanent detention!" (R) Revan fed off Meetra Surik's spirit to counter the effects of Emperor Vitiate's drain life. This section is also known as ionize, stun droid, disable droid, or destroy droid. (SF) Revan malfunctioned the Star Forge's electrical prisons holding Jedi hostage. You can dispatch each of the Jedi bodies by using offensive Force powers on them, thus depriving Malak of his power. You can use any light side power on the bodies and malfunction the terminals themselves, thus stopping Malak from utilizing his drain life. The Jedi hangs in the grasp of the electrical prison. Only by using the power of the Force could you free him now . . . The Jedi has been freed from the grasp of the electrical prison. His soul has become one with the Force. This section is also known as TK, move object, object manipulation, Force push, Force pull, Force shove, Force slam, Force strike, Force throw, Force thrust, Force tug, Force lift, Force blast, Force burst, Force wave, Force grip, Force choke, Force wound, Force kill, Force crush, inflict pain, or Force whirlwind. (DW) Revan hurled a large stone sarcophagus lid instantaneously. The instant before they detonated, Revan reached out with the Force and hurled the heavy stone lid of the sarcophagus toward the grenades. It acted as a shield, absorbing the worst of the blast before exploding into pebbles and dust. (R) Revan ripped a vaulted stone archway off the ceiling, showering the Imperial Guard in debris. At the far end of the hall, another half a dozen of the Imperial Guard rounded the corner. Revan reached out with the Force and ripped the vaulted stone archway in the ceiling above them free from its setting. A shower of dust and debris rained down on the reinforcements, sending them into temporary retreat. (R) Revan blasted open large durasteel doors, then slammed them shut. Before they could join the fight, Revan thrust his hand, palm up, in the direction of the (enormous) durasteel doors, blasting them wide open with the power of the Force . . . Revan reached out with the Force and slammed the durasteel doors shut, the clang echoing loudly in the throne room. (R) Revan let the light and dark side flow through him like twin rushing rivers and released the Force in its purest form. The blast of energy lit up the air across the forty meter walkway, made Revan himself stagger, and sent Emperor Vitiate flying backward and land unceremoniously in a heap on the floor. Revan began to sense the oppressive presence of the dark side weighing down on him. The Emperor was trying to crush his will: to dominate and enslave his mind as he had before. This time, however, Revan was ready. Author's note: A brush of Emperor Vitiate's mind collapsed Lord Scourge to the floor. Akin to the Emperor, Revan likely diverted a significant portion of his will and power to fend off the Emperor's telepathic attack. (R) Revan was largely unaffected by Emperor Vitiate's charged telekinetic attack. > The Emperor created his first Voice after the legendary Jedi named Revan attempted to assassinate him on Dromund Kaas. Though Revan's plot failed, he approached within striking distance of the Emperor. To guard against further vulnerability, the Emperor created the Voice to deliver his orders while distancing himself from the forces that conspired against him. Centuries later, this very safeguard would save the Emperor once more. Author's note: The fact Emperor Vitiate charged up his power as Revan crossed the forty meter walkway and did not unleash it until the last possible instant, despite the obvious risk, suggests he could not have moved Revan without an unnatural amount of energy. The underlined segment likewise states the Emperor established the Voice to guard against further vulnerability after Revan came within striking distance of him; If the Emperor could have pushed Revan away at any moment, he would not have been described as vulnerable nor in need of protection. This suggests Revan and the Emperor were comparable in power. Author's note: Although Revan was taken off guard by Emperor Vitiate's amplified attack and did not have the time to defend himself, his passive Force barrier still rendered the potentially lethal attack harmless. (AL) Revan concealed his light side presence and intentions from the Korriban Sith Academy. A Jedi Knight infiltrated the Academy by posing as a Sith apprentice. After gaining Master Wynn's confidence, the Jedi revealed himself. Wynn and Yuthura attacked the Jedi, but both were defeated in combat. "I sense that you are very strong in the Force. That you have already honed some of your abilities. Jedi training, is it? What an odd thing to say, and, even stranger, I do not sense any deception within you. You are a curious puzzle, human, a puzzle with great power. With that kind of power, you could become a great Sith." > Korriban is home to the Sith Academy, an evil reflection of the Dantooine facility. The dark side is everywhere on Korriban, and walking the path of the light side will be very difficult. (DW) Revan dodged torrents of Basilisk war droid and Mandalorian fire. He sprinted across the center of the camp, heading toward the rear where the Ordo Basilisks were parked. Enemy blasterfire poured down, forcing him to duck, dodge, and weave, but none of the bolts found a mark . . . He charged the nearest rider, zigzagging to keep the Basilisk from getting a clear shot. Running directly beneath the belly of the low-flying beast, he leapt high in the air to slash his lightsaber across the droid’s tail. (DW) Revan moved his lightsaber faster than Mandalorians could react. Revan was in motion, his lightsaber flashing to life, before the words had finished spilling from her mouth . . . The blade went spinning out in a wide arcing path that ended both their lives before they could move. (R) Revan kept pace with Emperor Vitiate's Force lightning, even dodging one of the bolts. This section is also known as Force absorption, Force absorb, dissipate energy, negate energy, Force deflection, rebuke, or block. (★ R) Revan effortlessly absorbed and deflected Darth Nyriss' Force lightning storm back at her, turning her to ash. Under normal conditions, Darth Nyriss' Force lightning turned two guards to charred husks and forced Meetra Surik and Scourge, two of the most powerful Force users of the age, to not deflect with their lightsabers but completely jump out of the way. However, Darth Nyriss further charged her power across a long speech, increasing its potency to instantly disintegrate Meetra Surik and Scourge. Despite this, Revan instantly gathered the energy needed to surpass it (see also: Revan's Raw Power Overview blog). (R) Revan absorbed and reflected Emperor Vitiate's Force lightning with his lightsaber. The Emperor rolled over, lifted himself up on one knee, and his hands flew forward as he hurtled a bolt of dark side lightning at his enemy. It struck the Emperor in the chest, sending him sliding several meters back on the floor. For the first time the Sith’s emotionless veneer cracked as he let out a primal hiss of hate. (R) Revan absorbed a vast amount of Emperor Vitiate's energy before being overwhelmed, mitigating an attack infinitely greater than one which can turn a human to ash to simply giving second-degree burns. Revan’s body was engulfed in agony as the electricity coursed through his body. His skin began to boil and blister, the flesh of his face melting and sticking to the superheated metal of his mask as the Emperor poured more and more power into him . . . He tried to rise, but his injured body refused to respond. Instinctively, he called on the Force to give him strength and heal his wounds . . .
As Scourge reached them, Revan managed to stand up again. He reached out with an open palm and his lightsaber sprang from the floor and into his waiting grasp. The three of them stood side by side, two Jedi and a Sith Lord against the Emperor. Author's note: This showing does not suggest Revan is vastly weaker than Emperor Vitiate. In contrast to Yoda versus Darth Sidious, where both gradually released and intensified their powers until the climax, Revan and the Emperor paused and gathered all their energies for an all-or-nothing release. Thus, the difference in power between the Emperor and Revan was naturally exasperated, and the potency of the Emperor's Force lightning became greatly amplified relative. The Emperor also began charging his energies before Revan and was circumstantially boosted by the dark side nexus of both Dromund Kaas and the Imperial Citadel. Consider: If Revan absorbed all of the Emperor's energy, it would be a direct display of parity or superiority over the Emperor. Since Revan was not equal to nor greater than the Emperor, at least not in the given conditions, it logically follows that he was overwhelmed. However, the fact Revan absorbed enough to suffer only minor injuries that he quickly healed indicates Revan and the Emperor were comparable in power. (R) Revan quickly healed his second-degree burns from Emperor Vitiate's Force lightning. (BL) Revan used the Force to understand Shyriiwook. "I see you have a Wookiee with you. Can I assume you understand their language? For a fee, Czerka Corporation can provide a translator for you during your visit." "I'm trained in the Force. I'll have no trouble." "I don't have any experience with that. I just know that only the most adaptive people can understand the Wookiee language." (DW) Revan expanded his senses across the galaxy to find Meetra Surik. Once he had tried to reach out to her with the Force. Serving in battle with someone formed a special bond; even across the breadth of the galaxy he should have been able to get some vague sense of her presence. Yet he had felt nothing. The simplest explanation was that she had become one with the Force, but Revan couldn't allow himself to believe she was dead. (BL) Revan subconsciously resisted the Jedi Council's attempt to fully erase his memories. "Even the combined power of the Jedi Council couldn't keep your true identity buried forever, could it?" "The Council has failed in their attempt to make you their pawn! The will of a Sith Lord is not so easily manipulated!" (AL) Revan resisted the dark side energies of Korriban and thousands of Sith spirits. Korriban is home to the Sith Academy, an evil reflection of the Dantooine facility. The dark side is everywhere on Korriban, and walking the path of the light side will be very difficult. After you’ve infiltrated the Sith Academy, you learn of a grand tomb located in the Valley of the Sith . . . Soon you may start to hear things such as harsh voices slowly drifting through the thick air. Your heart will begin to beat faster, and your skin will begin to itch under your collar with the urge to climb back into your ship and leave this soulless place behind forever. Korriban is a graveyard of Sith Lords and a former power base of the Sith Order . . . Hundreds of ancient Sith sorcerers wait within the mausoleums. They lie in their dusty beds waiting to devour the weak and unworthy. The Valley seethes with the foul energy of a thousand restless spirits murmuring of sinister glories. (★ R) Revan largely resisted the combined telepathic attacks of Emperor Vitiate and the Dread Masters, a group of six immensely powerful Sith Lords capable of ravaging Republic fleets with waves of hatred and bringing the Outlander to his knees from across the galaxy, for three-hundred and eight years. "I spent three hundred years in lock step with the Emperor's mind. I know what he's become, what he wants." As he spoke, the dark circles of his eyes seemed to fill with a swirling red mist, and for a brief instant the Emperor gave Scourge a glimpse of his true self. He wanted information on the Republic and the Jedi. How strong were they? Where were they vulnerable? How much did they know about the Sith and the Emperor himself? He wanted information on Revan. What had happened during his own invasion of the Republic? Why had it failed? How had he freed himself from the Emperor’s control? The answers were all there, but Revan would not surrender them easily. Though he was physically helpless, mentally he was strong enough to wage war against the Emperor, guarding his secrets for however long it might take. "The Emperor sought to pry the Foundry's location from the Jedi's mind. But for centuries he resisted." "The Emperor had three hundred years to break this man, and he never succumbed?" -- and repelled the Emperor's attempts at corrupting him into a mindless, loyal servant. "He wants me to be Darth Revan again, serve him as I did centuries ago." "The Emperor couldn't break me. Even death could not stop me. I will finish what I've started. And you will not interfere again." Eventually, Emperor Vitiate and the Dread Masters focused on wrenching apart Revan's dual personalities created by the Jedi Council's memory wipe, believing Revan was too powerful to influence otherwise. This was also largely unsuccessful because the split never finalized until after Revan escaped imprisonment. "So many centuries. The Emperor and his Dread Masters, trying to wrench me apart, to unleash my anger and hatred." "That's why the Emperor tried so hard to split you up. Two pieces working separately aren't nearly as good as one whole, working together. / Each part of you was needed as much as the other. The Emperor split you apart, because you were strongest when you were together." Author's note: Emperor Vitiate slowly drained Revan's Force power across the mental war. To counter this, Revan passively fed off Meetra Surik's spirit, equalizing the battle conditions (see also: II/Force_drain/R/1). This section is also known as durability, endurance, fortitude, stamina, vitality, or resilience. (BL) Revan withstood an explosion at point-blank range with little injury. (BL) Revan withstood torture to the point it was futile even to try to break him, according to Saul Karath. "I doubt torturing you will gain me your true cooperation. Your will is too strong to be broken that way." (AL) Revan withstood continuous Force lightning attacks by Jorak Uln, then defeated Uln in battle with Mekel despite the injuries. Revan was the first Sith captive that survived through the punishment. "Now, this is odd. The test is over and you're both still alive. Well that's never happened before." (SF) Revan fought armies on the Star Forge for over an hour before even confronting Bastila Shan. The next hour is spent frantically blasting, swiping, and crushing countless Dark Jedi and Sith heavy weapons and elite troopers on your way through the decks of the space station. (DW) Revan endured three years of isolation, interrogation, and torture from Scourge. Interrogating the Jedi had resulted in nothing but frustration and dead ends. His will was strong, as was his command of the Force. Even drugged to the edge of unconsciousness he was able to draw on it to help him endure the pain and the relentless barrage of questions . . .
Nyriss wanted to know how he had escaped the dungeons of the citadel. She wanted to know about his relationship with the Emperor. She wanted to know why he had come to Nathema. On all those counts, Scourge had come up empty. Revan was resisting him . . .
With difficult subjects you had to be patient. It might take multiple sessions over several days to get anything useful. But even knowing this, Scourge didn’t hold out much hope for his chances with Revan. F (Foundry) - Revan's mind splintered to a dark and light half during his captivity. When freed by Republic forces, an unbalanced and vindictive Revan plotted to genocide the Sith species with an army of battle droids created by the Foundry, but he was killed by an Imperial strike team (3642 BBY). SOR (Shadow of Revan) - Revan's light half became one with the Force while the darker half resurrected his body and plotted to destroy Emperor Vitiate once and for all (3642 BBY to 3638 BBY). TOS (Temple of Sacrifice) - Revan attempted a ritual of draining all life on Yavin IV to battle Emperor Vitiate, but a coalition of Republic and Imperial forces feared and thwarted his plans (3638 BBY). FT (Forgotten Terrace) - Revan retreated to the Forgotten Terrace, but another strike team defeated him. His light side spirit pacified him, and the two merged together for a final death (3638 BBY). THE OUTLANDER was the galaxy's greatest champion and generally accepted as either the Hero of Tython or the Emperor's Wrath, the most powerful warriors of their respective factions. The Hero killed the weakened Emperor's Voice, the host body of Emperor Vitiate with his full "power and consciousness," in an "apocalyptic battle." The Wrath defeated Jedi Master Wylett, classified as a"superweapon" by Republic intelligence, the Voice of the Emperor, possessed by the nigh-planetary dark side entity Sel-Makor, and Dark Council member Darth Baras, empowered by Sel-Makor and described as "nearly-indestructible." DARTH MARR was the longest serving and de-factor leader of the Sith Empire's Dark Council. Marr “routed whole armies and deflected assaults more thoroughly than any planetary shield," dominated Darth Lachris, moving invisibly fast and instantly overwhelming her with the Force, and was indifferent to multiple threats by Darth Nox, even after watching her "utterly destroy" the "supremely powerful" Darth Thanaton. SATELE SHAN was the Grand Master of the Jedi Order and equal to Darth Marr in power. Shan disabled four Sith warriors before they could react, dueled Darth Malgus and absorbed and cracked his lightsaber with her palm, and conjured a Force bubble immune to hex droid fire and the vacuum of space. (F) Revan became far more powerful than the protagonists and any Jedi before him. Revan has become more powerful than any Jedi has ever dreamed of. Revan has become more powerful than you could possibly imagine. (SOR) Revan became far stronger than ever before following his resurrection. "My mind is clearer, my power intensified." > "Death is not an ending, boy - but it is a passageway to something greater I have been through death and conquered it. I have returned with my power multiplied." (SOR) Revan was one of the most powerful Force users in the Old Republic era. "Revan travels to a very iconic Yavin IV to go to battle and release the actual Emperor, one we thought who was defeated not long ago. The player is pulled into this struggle of two of the most powerful Force users, like ever, in the history of the Old Republic, if not beyond - Revan and the Emperor." Revan, one of the most powerful characters in The Old Republic era. Go head-to-head with Revan, one of the galaxy’s most powerful characters. Author's note: The underlined segment suggests Revan and Emperor Vitiate were comparable in power. (SOR) Revan was the greatest hero of the Old Republic era, including the Outlander. Carry the legacy of the galaxy’s greatest hero with you into battle. Author's quote: This quote applies to the galaxy after the Knights of the Eternal Throne expansion. (F) Revan held his own against an Imperial strike team of the Empire's greatest champions until he was killed. The circumstances of the defeat can largely be attributed to suffering three centuries of torture and being drained by Emperor Vitiate and the Dread Masters yet only having days to recover, and that Revan's mind had begun to splinter into two separate, rival entities, interfering with his capacity to fight since both personalities had different intentions within his body. Despite this weakened state, Revan became far more powerful than any of his opponents or any Jedi before him by channeling both sides of the Force in battle. To take the station, the Empire sends a small group of its most powerful champions to the asteroid surface to storm the base. "You must not underestimate the Republic defenses, or the Foundry's Jedi Master. He is the greatest threat." (TOS) Revan held his own against a "large strike team of elite heroes," led by the Outlander, until he was defeated, fighting across three levels of terrain and later noting they barely managed to defeat him. The circumstances of the defeat can partially be attributed to the aid of Revan's spirit, who resurrected those Revan killed in battle and raised the strike team to higher levels of the temple as Revan advanced upward. "Revan['s Spirit] wants me to succeed, but claims I can't do it on my own." "You barely managed to drive me away last time. What makes you think you can survive against me?" "I am with you. Be strong . . . I am doing all that I can. I only hope this will be enough . . . Brace yourself . . . Do not let him win." "If you may not know, in Shadow of Revan, we launched what is definitely the most difficult operation boss we ever put into our game - Revan himself. In fact, he is so hard that to this day, five months later, very few guilds in the world have even gotten to him, nevertheless even beaten him. It's a big deal to take down Revan." (★ FT) Revan nearly defeated a strike team consisting of the Outlander, Darth Marr, Satele Shan, Lana Beniko, Shae Vizla, Theron Shan, and Jakarro, overpowering them many times in battle. Satele Shan used battle meditation to "greatly increase" the "combat effectiveness" of the strike team and healed or revived those injured in battle. Theron Shan ordered an XS stock light freighter to provide strafing runs on Revan [a]. The circumstances of the defeat can largely be attributed to the aid of Revan's spirit, who shielded the Outlander [b] and helped free all the others when overwhelmed by Revan's power [c], his injuries sustained from the aforementioned fight, such as a one kilometer-destroying blast overloading inside of him and his Force essence being violently stripped, and that Revan likely did not want to kill any members of the strike team but use them as fuel for his ritual (see also: III/Force_lightning/FT/1, III/Force_drain/FT/1). "We'll need our full strength to defeat Revan when the time comes. Don't do anything to jeopardize that." "But we aren't finished yet. There is one element even our combined militaries will be unable to stop." "He is strong with the Force! . . . I will see you break! . . . It is over for you, Revan!" "Grant me strength! . . . Revan, don't be a fool! . . . Press the attack!" "The Force is my servant! . . . Be strong! . . . So much power!" "Tough sucker! . . . Have some more! . . . Love a good scrap!" "Don't let up! . . . I won't let you win, Revan! . . . Let's go, people!" "Make him bleed! . . . Get him, Jakarro! . . . Hit him with everything!" (SOR) Revan knew of a ritual involving the Temple of Sacrifice and The Machine capable of extinguishing all life on Yavin IV. After The Machine was destroyed, Revan plotted to initiate another ritual of similar potency without any weapons or armies available to him, although how he planned to do this is unknown. "A 'device for mass ritual sacrifice'? That's seriously what he called it?" "Capable of killing every living thing on this moon, as fuel for the Emperor's resurrection." "Everyone outside the temple will die shortly. It has to be this way. This is for the good of the galaxy, I promise you." "Impossible. The ritual hasn't even begun!" (SOR) Revan may have used Sith alchemy to create Malaphar the Savage, the greatest Massassi. "Trouble up ahead. I don't know if the Revanites have been experimenting or what, but they've got their hands on the mother of all Massassi." (TOS) Revan imbued HK-47 with a tremendous amount of raw Force essence, enhancing his armor and weaponry enough to battle the strike team (also known as: Force imbue, imbue item, or Force weapon). HK-47 has been imbued with a tremendous amount of raw Force essence. (TOS) Revan conjured Force aberrations, twisted masses of raw dark side energies. (★ F) Revan pulled down around forty large asteroids with such force they pulverized on impact. Author's note: The Old Republic's script states Revan "threw" [a] the asteroids and that they were "giant" [b]. (TOS) Revan manipulated the Machine Core superweapon (I). Later, Revan broke it from its stasis beams and pulled it down against a font of energy flowing upward while significantly injured (II). (TOS) Revan instantly destroyed five large pillars (I). Revan's spirit lifted two bridges simultaneously (II). Author's note: While only one bridge is shown in the video, the other is roughly the same size as the one seen. (TOS) Revan telekinetically controlled two lightsabers in combat while fighting with two other lightsabers in hand (also known as: telekinetic lightsaber combat, kinetic combat, lightsaber throw, or saber throw). This lightsaber is being controlled via The Force. > Traya uses vast telekinetic powers to wield a trio of lightsabers against her. (★ FT) Revan unleashed a blast of energy that hurled back the Outlander, Darth Marr, Satele Shan, Lana Beniko, Shae Vizla, Theron Shan, and Jakarro, then formed a whirlpool of debris around himself. Author's note: The fact Revan did not kill the non-Force sensitives does not suggest the attack was weak; It still threw back the Outlander, Darth Marr, and Satele Shan, and the non-Force sensitives had defensive energy shields. There are many examples of powerful Force users, including Darth Caedus and Darth Vader, failing to kill non-Force sensitives with telekinesis. Also, there is significant evidence that Revan did not want to kill the strike team but use them as fuel for his ritual (see also: III/Force_lightning/FT/1, III/Force_drain/FT/1). (★ FT) Revan dominated Darth Marr, Satele Shan, Lana Beniko, Shae Vizla, Theron Shan, and Jakarro, pulling them all into himself, forming a Force maelstrom, and hurling them backward and incapacitating them in suspension against pillars (see also: III/Force_barrier/FT/1). The light side Force users were sundered in dark side energies and the dark side Force users were trapped in light side energies. Revan blasted the team and the Outlander with Force destruction, slowly siphoning their power and killing them (see also: III/Force_drain/FT/1). The team was helpless against Revan and would have been killed if not for exterior aid. Destroying all. [The strike team is] slowly being destroyed by Revan. Author's note: The Outlander was shielded from Revan's attack by "light side echoes" and "dark side fissures" [a], likely created by Revan's spirit. The Outlander freed those encased in dark side energies with light side energies and vice versa [b]. This failed attack likely greatly exhausted Revan, leading to his eventual defeat. This section is also known as Force shock or Sith lightning. (F) Revan formed Force storms against the strike team (also known as: Force lightning storms). (TOS) Revan charged his lightsaber with Force lightning, increasing its potency. Lightsaber is overcharged with lightning. The next few basic attacks instead deal damage in a 120 degree arc. (FT) Revan instantly killed eight Republic soldiers with a burst of energy. Author's note: The fact Revan's Force lightning killed the armored soldiers yet stunned Theron Shan, and Jakarro indicates Revan did not plan to kill the latter but use them as fuel for his ritual. Otherwise, Theron Shan and Jakarro would have likely died shortly into the fight (see also: III/Force_drain/FT/1). (F) Revan temporarily formed an impenetrable bubble on the brink of death. (FT) Revan created a near-invulnerable energy sphere capable of withstanding the strike team's lightsaber strikes, Force attacks, blaster fire, explosives, and XS stock light freighter strafing runs [a]. > "Force maelstrom creates an invulnerable energy sphere to block incoming attacks." (F) Revan vanished is an explosion of Force energy. (★ TOS/FT) Revan teleported away from the strike team to reassess or escape dangerous situations (I). Later, Revan teleported around the battlefield to dodge attacks and exploit favorable opportunities (II). (SOR) Revan pinpointed Tari Darkspanner from across the galaxy despite the two having no prior relations, then appeared before her in a vision telling her to leave Dromund Kaas and seek him out. Darkspanner learned the truth of Revan’s fate when the man himself appeared to her in a vision beckoning her to leave Dromund Kaas and seek him out. Impressed with all she’d accomplished as the self-appointed “Master” of the order, Revan offered Darkspanner the opportunity to expand the order’s roster and purpose. (FT) Revan used Force affliction against the strike team (also known as: Force slow). (TOS) Revan's spirit resurrected fallen heroes in their battle against Revan. Boon of the Spirit. Target has been recently resurrected by an outside force. (FT) Revan siphoned off the strike team as an element of his Force destruction. Consuming siphon . . . Slowly being destroyed by Revan. Author's note: The fact Revan gradually drained the incapacitated strike team, rather than immediately kill them and begin his ritual of resurrecting Emperor Vitiate, despite coalition armies approaching, indicates this likely was the starting act of the ritual. The conditions - standing in the center and drawing on the power of those in the surrounding circle - resembles other rituals Revan had created (see also: I/Knowledge/UR/3). Thus, Revan likely planned to subdue, not kill, the strike team in battle (see also: III/Force_lightning/FT/1). (FT) Revan melded drain life and drain force and used it against the strike team. Life and force power are being drained. With each charge Revan goes in power. (F) Revan channeled both sides of the Force simultaneously to increase his connection to the Force. (FT) Revan kept up to speed with the Outlander, Darth Marr, Satele Shan, Lana Beniko, Shae Vizla, Theron Shan, and Jakarro, simultaneously dodging and deflecting their Force attacks, lightsaber strikes, blaster fire, and explosives from all sides. An XS stock light freighter also provided strafing runs against Revan [a]. The following highlights the speed of Darth Marr, Lana Beniko, the Outlander (I), and Satele Shan (II). In an instant, he was gone. Her nostrils flared slightly as she tried to sense his presence. “You believe you have earned that power, but you are mistaken,” his voice thundered behind. > When an Imperial officer suggested [Lana Beniko] would not understand the nuances of conflict, he lost his right hand to a lightning-fast lightsaber strike. (SOR) Revan pinpointed Tari Darkspanner from across the galaxy despite the two having no prior relations. (SOR) Revan likely sensed the Outlander and Lana Beniko covertly investigating around Rishi. "Data from the Nova Blades hinted at the location of a Revanite safehouse in Raider's Cove. We looked into it and were ambushed." "Revan knew we were here." "It looks that way. It's possible he may have sensed our presence." (★ SOR) Revan was killed in the Foundry, exasperating the split between his two selves. His darker half refused to become a spirit, separated himself from his light half, and resurrected his corpse from the dead. "You hid behind Jedi platitudes! You weren't strong enough to survive the torture, or the battle in the Foundry. I faced them! I survived them!" "You've carried on, dragging the remains of a body that should have long since faded to dust . . . When I died, I had come to terms. I was ready to become one with the Force. But I soon realized that was only what part of me wanted." "I cast you out! It was the only way to go on - to remain and finish what we started! You were holding me back!" "I saw you die. I watched you take your last breath and say your last words." / "You seem rather alive for someone who is suppose to be a corpse." "Oh, I was dead - for all but a blink . . . Goading me into battle might have worked before I died, but not anymore . . . I've been reborn. My mind is clearer, my power intensified. And now, with the order under my command, I'm unstoppable." "You were reported dead. Was that report wrong?" "Only somewhat. When a goal is important enough, one learns to overcome any obstacle." "When the Emperor's followers struck me down, I learned to release my attachments." "Then who's wearing your mask and leading your followers?" "I - I do not know. But I recognize much of myself in him. The darkness I left behind." Revan became a galactic disturbance likely due to his resurrection, affecting the tapestry of the Force and bringing it to roil and convulse like never before. The Force itself intervened and altered the Outlander's ship coordinates to Rishi to stop Revan, marking the first known instance where the Force physically intervened to correct its current - the second being the conception of the Chosen One. "The Force moves through the Emperor's Hand in a manner that few others experience. For us, the Force is an intricate tapestry woven into our very essence. That tapestry has become flawed. I speak of a persistent disturbance. A cyst, dense and tangled and unpleasant. It began small and nearly imperceptible but has been growing ever larger. The source of this basal disturbance is of the gravest concern to us." "The Force roils and convulses like never before. I reached out to study its peculiar activity, and in turn it showed me what is to come. You stand on a moon, defiantly, before one who is not one. You do not stand alone, but you fail all the same." "There's something in the Force that I've never felt before. It exists nowhere and everywhere at once. Writhing, growing. I think I sense this "growth" because I'm tied to it somehow, maybe by association to Darth Arkous. I think the Empire's in terrible danger . . . If I'm wrong, it means my instincts are now deeply flawed. Considering the strange disturbance I sense that continues to pervade the Force, I worry that these concerns are merely the figments of a deranged mind." "Coordinates for Rishi = entered into navicomputer. T7 = thought Mastered entered new destination." "Wasn't me. I've never heard of the place." "Confirmation. We need to travel to Rishi, right away." (SOR) Revan's spirit persevered on Yavin IV, which Darth Marr found to be almost impossible. "You sense it too. Not the ancient Sith, or the Emperor. Not Revan. Another presence, different from the rest." "Yes. It is more like you." "I sense it too. Is it really possible that a light side presence could exist here?" "Are you saying there's another Jedi somewhere near us?" "No Jedi could survive here alone. It is a vestige at most." "You sell us a bit short, Marr. But, in answer to your question, no: the presence isn't exactly that of a Jedi, either. It's still very difficult to pinpoint." (★ SOR) Revan tanked a direct strike to the neck from Satele Shan without breaking stride, indicating he was near-invulnerable to lightsaber strikes because he held his body together through sheer willpower, visibly tanking a direct strike to the neck from Satele Shan without breaking stride. (★ TOS) Revan attempted to channel the energies of The Machine to destroy all enemies, including the strike team and the coalition armies, within a one-kilometer radius. However, Revan lost control of the power when ambushed by a strike team, and the energies overloaded and backlashed inside of him. Instead of instantly disintegrating, Revan internally tanked the attack, declared, “No! I won’t be denied! I will never give in!” and continued fighting. Through masterful control of the Force, Revan has created a Force resonance with The Machine's core, and is channeling its power into an immense attack. Upon successful completion, [Revan] deals massive damage to enemies within 1km. Dealing sufficient damage will break this channel. [Revan has] suffered a powerful backlash while channeling an immense amount of Force energy. (TOS) Revan had his life force violently stripped from him by The Machine Core, an unstable superweapon made of early Iokathian technology and a maelstrom of twisted Force essence with the potency to drain all life across Yavin IV. However, the attack had no noticeable impact on Revan, who continued fighting. The Machine Core has been rendered critically unstable. It is now a violent maelstrom of twisted Force essence, indiscriminately stripping the life force from everything in the vicinity. (TOS/FT) Revan refused to surrender despite the two aforementioned injuries and the significant damage sustained by the strike team. Instead, he teleported to the Forgotten Terrace and engaged another strike team of powerful individuals. Despite being defeated once more, Revan rose again and prepared for battle. "You may have put an end to this plan, but so long as I have breath, I will have my vengeance!" "I won't stop. Not until I conjure the Emperor. I have to face him." darthant66 has not linked a Twitter account.